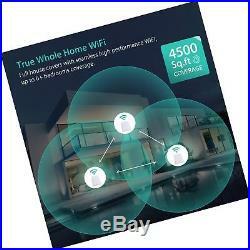 MeshForce Whole Home Mesh WiFi System (3 Pack), Dual Band AC1200 Router Replacement for Seamless and High Performance Wireless Coverage up to 6+ Bedrooms. 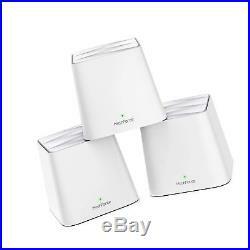 Color:3 Pack Introducing MeshForce M1, the all new mesh technology integrated whole home mesh WiFi coverage system. Seamless and super high performance coverage across your home. One SSID for Entire HomeMesh technology allows multiple mesh points communicate with each other and self-heals the network quality. It allows you walk from upstairs to down, from garage to backyard without disconnecting because the mesh system always back your strong WiFi signal. Go Mobile, Go FurtherWe made setup and manage WiFi easier. Now you can set up your WiFi with My Mesh mobile app, rather than through your old routers complicated admin page. You can even control your home WiFi remotely in the App (Sign-in required). Compact, but PowerfulEverything is in the tiny white cube, AC1200 dual band (5GHz/2.4GHz) concurrent broadcast WiFi, up to 1500sq. Ft coverage each point, no external antenna exposed. Fits your home style, satisfy your WiFi needs. Place a Mesh Point to Where You NeedSetup the main point and the rest points will join WiFi system automatically, simply place the point to where you need it, eliminate dead zones. Supports up to 6 mesh points and 60 devices. Secure Your ConnectionYour WiFi is secured by MeshForce WPA2-PSK Mixed encryption, and guest mode allows you set up a separate WiFi for guests. Protects your WiFi password and personal data. Tech Specs:AC1200 simultaneous Dual-band WiFi, 5GHz: Up to 867Mbps 802.11ac/a/n, 2.4GHz: Up to 300Mbps 802.11b/g/nMixed WPA/WPA2-PSK Security1x shared 100M WAN/ LAN Port / 1x 100M LAN PortSupports PPPOE, Dynamic IP, Static IP, Bridge ModeAPP System Requirements:Use iOS or Android mobile device to setupiOS 9 or higher/ Android 4.4 or higherIn the Box:3×MeshForce WiFi Points3×Power Adapters1×Ethernet Cable1×Quick Start Guide. Make sure this fits. By entering your model number. The Next Generation WiFi: MeshForce M1 comes for the future of WiFi, its time to replace your wireless router and extenders, and build a true WiFi system for your home. The flawless and flexible AC1200 dual band WiFi connectivity supports up 60 devices, it is a hub to connect your smart devices from PC, mobile, TV, to IP camera. Eliminate Buffering and Deadzones: Covers more than 4500 square feet from garage to backyard, seamless single WiFi name for entire home, high performance WiFi network covers 5+ bedrooms. Flexible deployment allows up to 6 points wherever you need WiFi. No matter apartment, house or office zone, MeshForce M1 is ready. 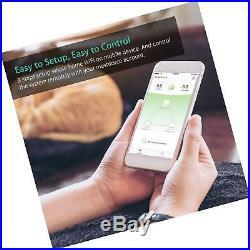 One Home, One WiFi, One App: Find a quickest path to get everything done, build a whole home WiFi system is easy. 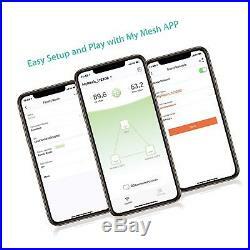 Download My Mesh App on your iOS or Android device, set up main mesh point, plug the others and they will join the system automatically. 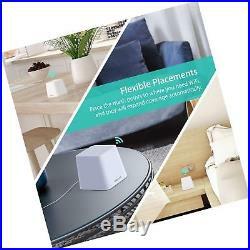 Safe Connection to Your Smart Home: Your data and WiFi access are well protected under WPA/WPA2 PSK Mixed security industry level password encryption. Welcome your visitors and friends with guest network in isolated WiFi zone, safeguards your privacy and smart home access in pocket. Product Dimensions: 4 x 4 x 3.7 inches. Item Weight: 2.85 pounds. Item model number: M1-3PACK. We are not responsible for any incorrect or undeliverable addresses. Message us for return instructions if you have further questions. We take our reputation seriously! 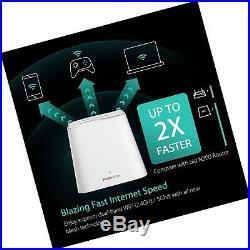 The item “MeshForce Whole Home Mesh WiFi System (3 Pack), Dual Band AC1200 Router Repla” is in sale since Monday, November 12, 2018. This item is in the category “Computers/Tablets & Networking\Home Networking & Connectivity\Wireless Routers”. The seller is “timetoorder” and is located in United States. This item can be shipped worldwide.